Two-time Eclipse Award winner Chad Brown will hold a strong hand on Saturday at Saratoga Race Course in Saratoga Springs, N.Y., as he seeks his fourth training victory in the Grade 1, $500,000 Diana for fillies and mares on the grass with an accomplished trio of Sistercharlie, A Raving Beauty, and New Money Honey. The 80th running of the 1 1/8-mile Diana, the first Grade 1 of American racing's premier 40-day meet, will be joined on Saturday by the Grade 3, $150,000 Sanford for 2-year-olds. Both races will be televised live on a special, extended edition of Saratoga Live, presented by Claiborne Farm, airing on FS2, MSG+, FOX Sports Prime Ticket, Fox Sports San Diego and Altitude Sports from 4-7 p.m. ET. Peter M. Brant's Sistercharlie will be cutting back in distance on the Mellon turf course following a close runner-up finish in the 1 1/4-mile Grade 2 New York on June 8 at Belmont Park. In that race, her third since arriving at Brown's barn in 2017, the 4-year-old Irish-bred filly by Myboycharlie was bumped at the start and navigated through rivals with a late run to finish a head behind stablemate Fourstar Crook. In her seasonal debut, Sistercharlie came back from a nearly nine-month layoff to post a gutsy, 2 1/4-length victory in the Grade 1 Jenny Wiley on April 14 at Keeneland. Hall of Famer John Velazquez, who has been aboard for all three of Sistercharlie's North American starts, has the return call. Installed as the 9-5 morning-line favorite, the pair will break from the rail. A Raving Beauty is undefeated in two starts in North America for owners Michael Dubb, Madaket Stables and Bethlehem Stables, capped by a three-quarter-length score last time out in the Grade 1 Just a Game on Belmont Stakes Day. Group 1-placed in Italy before moving to the U.S. for a 2018 campaign, the 5-year-old German-bred Mastercraftsman mare won her continental unveiling in impressive fashion, tracking the early place before kicking clear in the stretch to win the Grade 3 Beaugay by three lengths on May 12. A Raving Beauty, 2-1 on the morning line, will be ridden by Irad Ortiz, Jr. from post 6. Rounding out the Brown triumvirate is e Five Racing's New Money Honey, exiting a neck victory in an optional claiming race on June 21, her first start of the year. The Medaglia d'Oro filly won the Breeders' Cup Juvenile Fillies Turf in 2016 and returned as a sophomore to win the Grade 3 Wonder Again and Grade 1 Belmont Oaks in 2017. New Money Honey, 8-1, will break from post 3 with Hall of Famer Javier Castellano aboard. Among those looking to upset the Brown train are Patricia L. Moseley's homebred Proctor's Ledge, who swept last summer's 3-year-old turf stakes for fillies with wins in the Grade 3 Lake George and the Grade 2 Lake Placid at Saratoga. 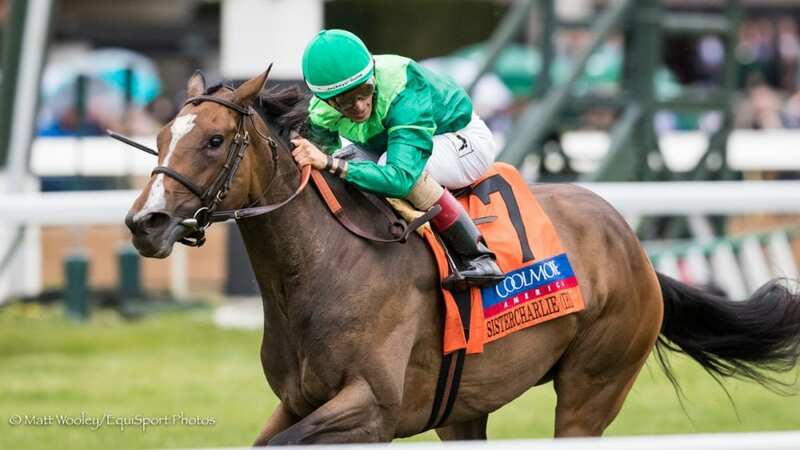 She earned her first victory since the Lake Placid two starts back with a half-length win in the Grade 2 Distaff Turf Mile at Churchill Downs on Kentucky Derby Day. Last time out, the 4-year-old daughter of Ghostzapper finished second in the Just a Game, running in midpack early and dug in down the stretch to get within a length of A Raving Beauty. “Obviously, it's a Grade 1, so it's going to be a tough spot, but she looks like she fits in there,” said trainer Brendan Walsh. “She's been able to run with those fillies all year. We're happy with her and she's doing great, so we're very confident she can run her best race and hopefully, it'll be good enough and we'll get some luck and be thereabouts. Proctor's Ledge, 4-1, will have the services of Jose Ortiz from post 2. Graham Motion trainee Ultra Brat will try to replicate her most recent effort, a 10 ¼-length win in the Grade 3 Gallorette on May 19 at Pimlico Race Course. Owned and bred by Alex G. Campbell, the 5-year-old Uncle Mo mare won the Grade 3 Marshua's River in her season opener and finished third in the Grade 3 Suwannee River in February before finishing a dull 10th in the Jenny Wiley. “I'd like to think I've given her plenty of time since that race because it was a big effort and I wanted to give her enough time to get over it,” said Motion. “She's done really well and I think she deserves another shot at a Grade 1. In the race at Keeneland, I didn't think she had the best trip, to be honest. She was very wide and things just didn't work out very well. I think when she did kind of make a move, she was very wide and lost all chance. At 8-1, Ultra Brat will be ridden by Joel Rosario from post 5. Rounding out the field for the Diana are Hawksmoor, fifth in the Grade 1 Gamely on May 26 at Santa Anita Park, and War Canoe, a recent half-length winner of an optional claimer on June 29. One race earlier, Starlight Racing's Tremont runner-up Sombeyay leads a field of eight in the six-furlong Sanford. Trained by Todd Pletcher, the juvenile Into Mischief colt broke his maiden at first asking, drawing off by 6 ¼ lengths on April 27 at Gulfstream Park, before stepping up to stakes company. In the Tremont, Sombeyay stumbled at the start but recovered well enough to finish three-quarters of a length behind Our Braintrust on June 8 at Belmont. Castellano will ride Sombeyay, favored at 2-1, from the rail. Also in the Sanford are fellow Pletcher trainee Lexitonian; speedy maiden winner Strike Silver for trainer Mark Casse; $400,000 2-year-old in training purchase Bano Solo; maiden winner Whiskey Echo, adding Lasix for the first time; Chase Greatness; and Knicks Go. Dream Maker will scratch from the Sanford and will be pointed to the Grade 2, $200,000 Saratoga Special presented by Coors Light on April 12, said Casse. This entry was posted in NL List, Racing and tagged a raving beauty, Chad Brown, Diana Stakes, new money honey, proctor's ledge, Sanford Stakes, saratoga, sistercharlie, Sombeyay, ultra brat by NYRA Press Office. Bookmark the permalink.